I do alot of my shopping online. Like, alot. Living in a place where my options are seriously limited I have learnt from a young age that the internet is the greatest place to have a good browse and spend up! So I thought I'd put together some of my favourite things about shopping online. I live on the Isle Of Wight so when I say my options are limited..... I am NOT kidding! I have to get a boat if I even want to pop to Primark which is a bit of an effort (and expensive) when you just want some cute pjs and cheap shoes. I'd say 90% of the clothing I buy is from online, same goes for alot of my make-up too - I can browse any store I want and find everything I cannot get hold of here in my home town. This has got to be everyone's favourite perk of online shopping. You can do it from the very comfort of your own home. Yes I am one of those girls who sits braless on my sofa drinking tea and flicking through 500 pages of the ASOS sale! I've even been known to order things whilst walking to work.... the joys of 3G eh?! Better than carrying a million shopping bags and being stuck behind slow walkers right? One of my ultimate number one tip-top tips for the internet. Always search for a voucher code before purchasing anything. I literally don't buy anything without quickly seeing if I can save money on it before hand. The amount of money I have saved over the years from doing this is insane - I don't understand people who don't do it! In what shop can you walk up to the counter, go to purchase something and before popping your card in ask... 'can I save money on this?' NONE! Voucher Bin - http://www.voucherbin.co.uk is awesome for this - even if it's just 10% off or free postage, it all helps! Just search the site you're shopping on or want to shop on in the search bar and all the current codes will come up for you! You can also look through categories, of my favourite to look in is Health & Beauty (obviously), if I'm after a certain product I like to shop around for the best code and then buy it from that particular site, such an easy way to save money on something you were going to buy anyway, make sure you check it out! Being on a tiny island it's not uncommon to see people with alot of the same stuff. Nowadays, yes, it's alot less than when I was younger as so many people do use the web but with only one decent fashion store in my town I see ALOT of people wearing the same popular garment/ensemble. The internet is an amazing place to find bits that no-one else will, there are so many sites (especially for fashion) it's so much easier to rock your own style and buy things (hopefully) others won't. 5. Bargains - the endless amount of bargains! Where else are you going to find a top for £2 or a dress that used to be £45 down to £7? I LOVE bargains and I basically live on the sale section of websites! eBay, ASOS, Brandalley - you can get some serious savings all from a few clicks of a mouse! 6. Who doesn't love getting post? Last but not least ..... post! Yes sometimes we may have to send things back if they don't fit but most places now do free returns (I HATE places that don't offer that!). But for thing like make-up and other beauty products I cannot explain my excitement when they arrive! What are your favourite things about shopping online!? ow wow - I cant imagine living on the Isle! I grew up in Soton, so West Quay was my saviour!! I do love online shopping, I am super lazy and hate the whole getting un-dressed to re-dress to un-dress and re-dress again haha! I always feel like someones sent me a present when I receive parcels in the mail! Even if it is a present to myself. I love shopping online and like you, always search for a voucher code before ordering something 9 times out of 10 I find one whether it be for free delivery or money off. I agree and I still got a rush out of buying something and receiving something in the mail. I don't think the thrill of online shopping will ever stop for me. I think the post is a massive part for me. It's like a present to yourself. I'm obsessed with online shopping which is bad and good at the same time I guess haha? Voucher codes are the best thing ever! And the fact you don't have to get dressed, what more could you want!? 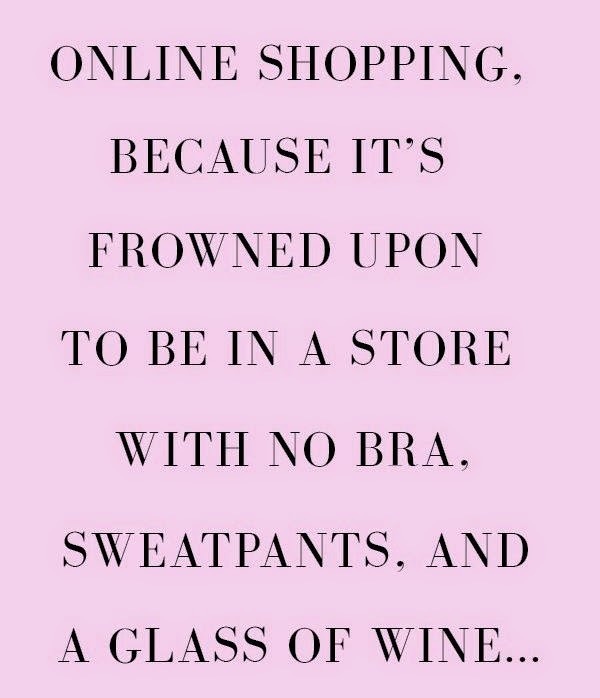 I absolutely love this post :) I've only got into online shopping recently but everything you've said here is so true, you just can't beat shopping on your sofa in your jim jams!